Back in May my folks picked up a lathe for my birthday and Christmas. My wife has expressed interest in turning so for Mother’s Day I picked up a pen turning kit with which she turned her first pen. One of the things she discovered was that turning the burl with the high speed steel lathe tools was… less than effective. So in the end I can’t give her a less than effective Mother’s Day gift so something must be done. We borrowed my father’s carbide lathe tool so she could finish up the pan and it worked great. There are two major components to carbide tip lathe tools, the metal bar the carbide tip mounts into and a handle. 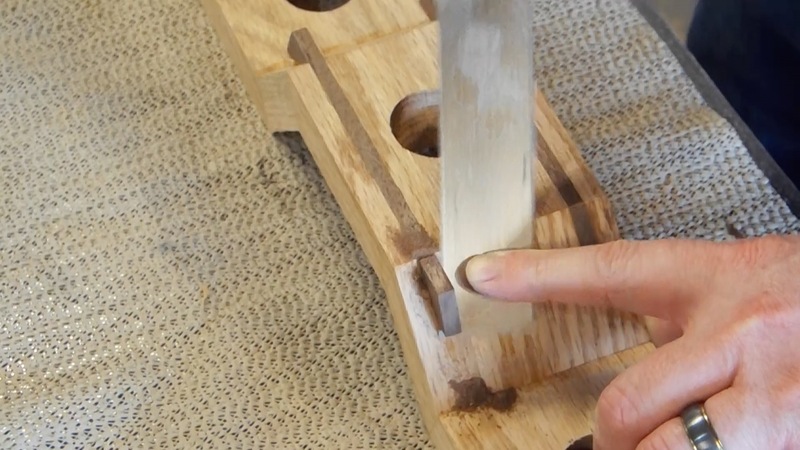 I suppose you could get away with one, just using a bar, but that would seem like a shame since you are presumably making beautiful items with the tool on the lathe and making a nice looking handle really isn’t that much work. I used 1/2″ square and round steel bars. Each of the metal bars were cut down to about 12″ in length. At the bench grinder I ground away a rabbet about the thickness of one of the carbide cutters about 3/4″ down the length of the bar. Then using a file I cleaned up the rabbet to make a flat mounting surface. The bar was then mounted in a vice at the drill press to have a hole drilled to tap for a machine screw to mount the cutter. The machine screws needed a small amount of counter sinking so the hole was followed up with a wider drill bit just below the surface of the rabbet. Tapping the hole is a bit of an art form. As you screw the tap into the hole small bits of the metal come off the walls of the hole which gum up the gullets of the tap. So you can only take a couple turns before the tap will just break off if you don’t reverse the cutting and clean out the gullets. A little machine oil helps keep things going mostly smoothly. Each hole took several minutes to tap since it took 5-8 times of screwing the tap in and reversing it to clear out the gullets. Testing each of the holes after tapping was also necessary to make sure that the threads engaged correctly. After the holes were tapped the nose of the tool then needed to be ground back. Back at the bench grinder the tip is rounded so that then cutters will engage the wood without having the material on the lathe hitting the nose of the tool. Also, for smaller cutters it was necessary to grind back nearly all the way to the counter sink. 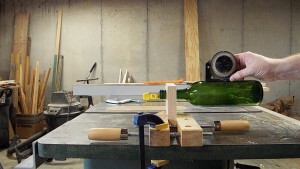 But make sure you leave a complete flat surface for the cutter to rest on when tightened into the tool. I rummaged through the scrap bin for small pieces which could be machined down to 3/4″ and about 12″ long. Then I matched the pieces I had remaining into groups of 2 matching pairs. 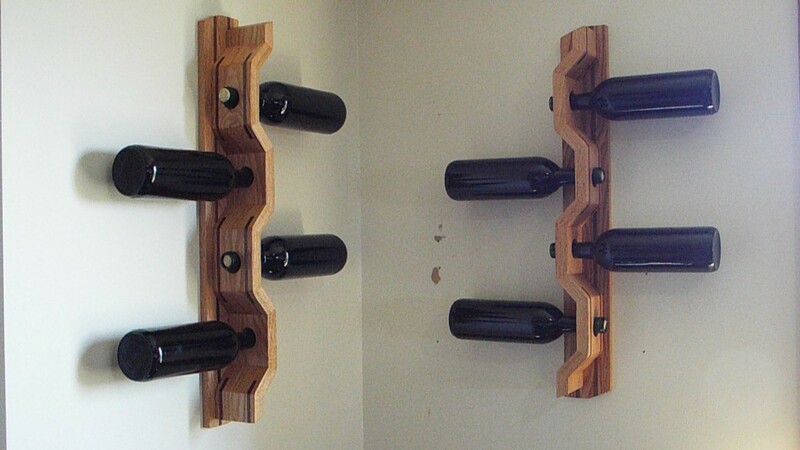 Each pair was glued up to make a 1 1/2″ x 3/4″ half of a blank. 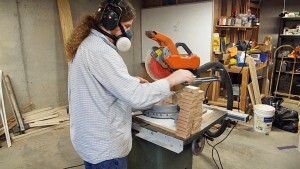 Then each of the halves was hand planed flat so that it would join smoothly with the other half of the blank. 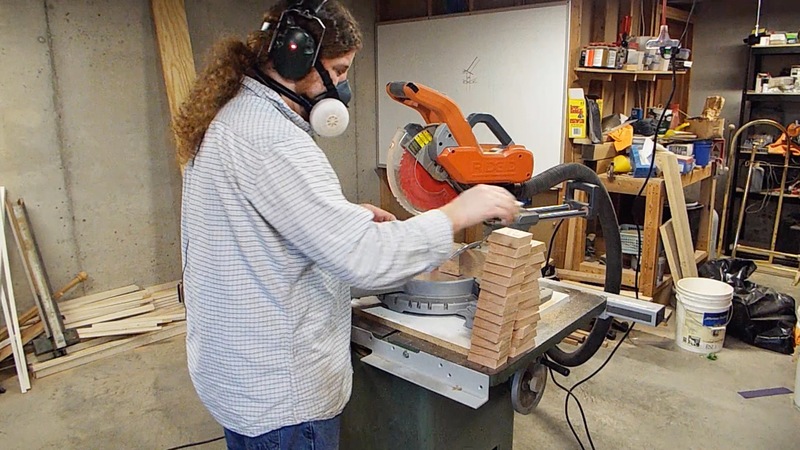 At the router table a dado was just slightly oversized into both halves of the blank about 4″ long. When the two faces were then placed against each other a bar could slide into the square hole and the bar was snug. 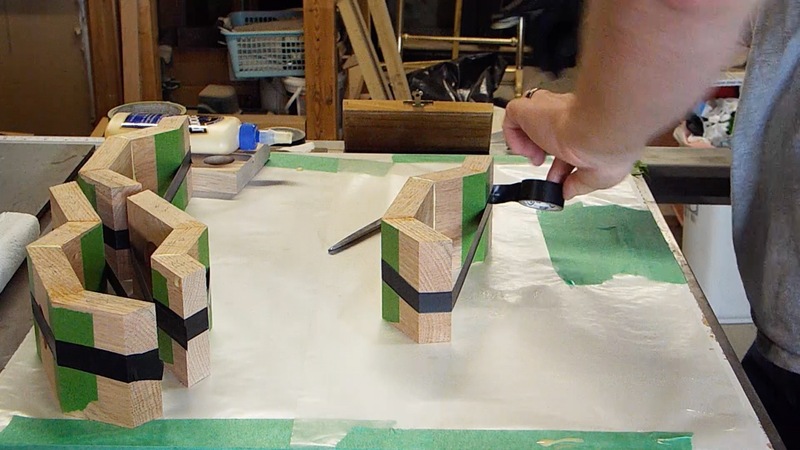 The two halves were then glued together using a bar slid into the hole for alignment. Then removed once the clamps were applied. 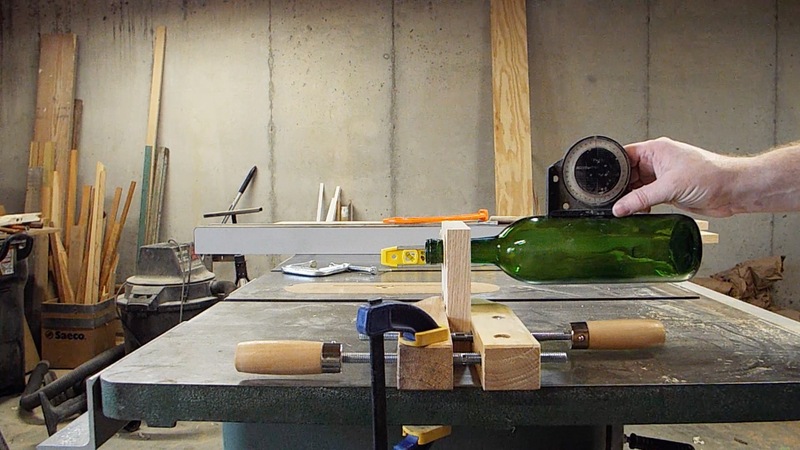 Once the glue was dried a 1/2″ plug was created and cut flush with the end of the blank. This plug would be used on the tail stock side of the lathe to center the handle. The handled was then turned round at about 700 rpm. Once round the lathe was turned up to about 1500 rpm. By the tail stock a tenon for the ferrule was cut about 3/4″ long. Then the rest of the handle was shaped. Most of the handles wound up with a bulb on the end and another bulb around the ferrule. The last one was shaped with a slight taper from the back to front for about 2/3 the length and then widened slightly for the last bit up to the ferrule, which is a preferred shape in my hands. I had a couple 3/4″ copper pipe fittings which I cut in half on the lathe. I turned a quick 3/4″ dowel and used one of the carbide cutters to cut the fitting in half. At least that was the cleanest method I came up with without having a pipe cutter to use. Assembly was done with epoxy. The epoxy was mixed and a little spatulaed down the hole in the handle. The bar was scored a couple times with a file and epoxy smeared on it and the bar was slid into the hole. Finally a little bit of epoxy was applied to the wood on the ferrule and the copper ferrule slid into place. The whole assembly was then clamped together and left to cure. Due to the excessive amounts of epoxy all over the place I had to use an old chisel to scrap it off the bars. Then I used a file to file the epoxy off of the ferrule, which was good, since they looked much better after being evenly filed. And the handles themselves were re-sanded to 600 grit because of the epoxy all over those. Finally boiled linseed oil was used to finish the handles and they were hung up and left to dry.